Of course it’s a cinch to make your own Greek dressing: 1/3 cup lemon juice+1 cup extra virgin olive oil+garlic+herbs. But the Cindi’s Kitchen bottled Greek with Feta and Black Olive Salad Dressing looked enticing at Whole Foods and was quite good for a bottled dressing (call me a snob). The bowl may look small in the photograph, but it was enough salad to feed 8 hungry folks, with crusty bread on the side. Other possible additions to this salad would be red onion, pepperoncini, chicken, salmon, shrimp or strips of beef. Chop romaine leaves, if using, and place greens in bottom of a large salad bowl. 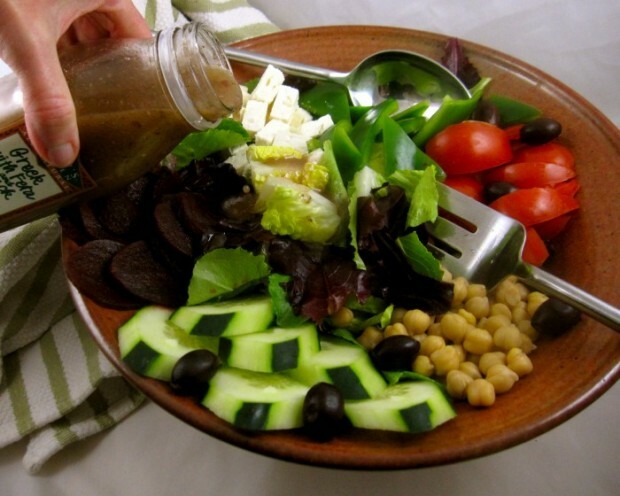 Arrange feta, beans, olives, tomatoes, peppers, cucumbers and beets over greens. Toss to taste with dressing and serve. *Amount of greens used depends on your desired proportion of greens to veggies and cheese.